Kisan Urea is a highly concentrated, solid, nitrogenous fertilizer, containing 46.0% Nitrogen. It is completely soluble in water hence Nitrogen is easily available to crops. It contains Nitrogen in a milder form which changes to ammonical forms and is retrieved by soil colloids for longer duration. Urea is available in granular form and can be applied by drill and broadcasting. 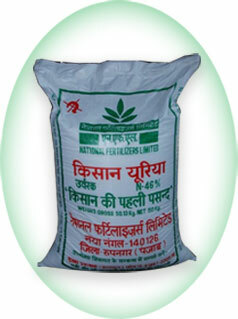 Kisan Urea is ideally suitable for all types of crops and for foliar spray which instantly removes nitrogen deficiency.Kisan Urea also has a strong and long lasting effect on crop resulting in bumper crops Carbonic acid present in Kisan Urea helps in absorption of other nutrients like phosphate and Potash by roots of crop.